I’ve been meaning to send out this post for several months now, originally intended to follow closely on the heels of the Turkish Lentil Soup. Distractions in the realms of summer fruit, fish in packets, and life in general have arisen lately, but wait no more. Turkish Dinner Part 2 is here, in its full splendor. The idea is to create a quick and hearty main course to accompany the soup. Originally conceived as a lamb burger slider intended to fit perfectly into a pita pocket and drizzled with a simple yogurt sauce, we ended up trying it with ground beef on account of Ava’s dislike of all things related to lamb (as least as of last week). For once, I’m grateful for a finicky kid palate because the beef version turned out to be almost as good, and I tend to keep ground beef in 1 pound packets stocked in the freezer. Why, you ask? Because the awesome grassfed beef producer at our farmers’ market sells them at a discounted price if you buy four packs. Which I do, and then appreciate having it on hand. But I digress.. In a medium bowl, lightly knead the ground lamb/beef with the onion, garlic, mint, parsley and 1 teaspoon each of salt and pepper. Mix gently but well. 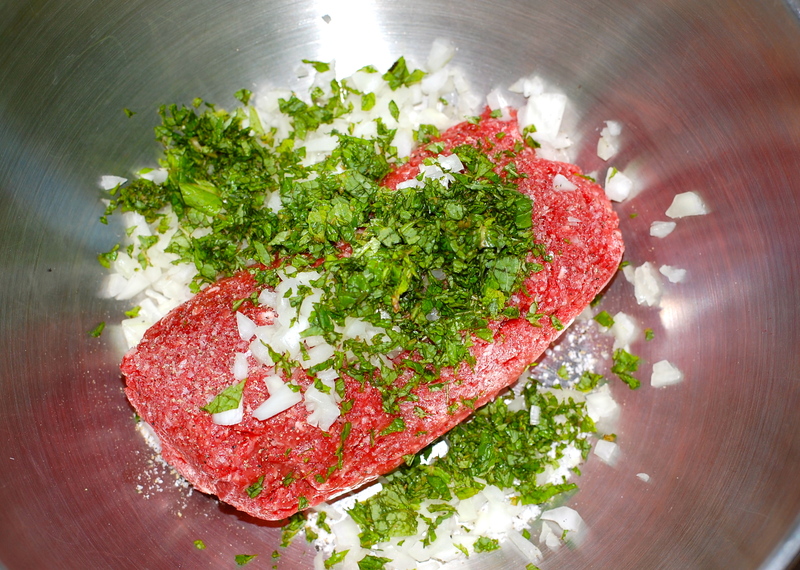 Shape the meat into small sliders, 1/2 inch thick, and line them up on a cutting board. In the meantime, pour 1-2 cups plain,whole milk yogurt into a serving bowl. Add any combination of the following, depending on preference and ingredient availability: 1 small garlic clove, finely chopped; 1/2 cup seedless cucumber, finely chopped; 1-2 tbsp fresh mint/parsley; several pinches of ground cumin and chili powder; salt and pepper. This is intended to be a very flexible sauce. Salt and pepper alone will do the trick in a pinch. Prepare either an outdoor or indoor grill, and grill the sliders for about 6-8 minutes to the desired doneness, turning once during cooking. Toast pita bread either on grill, in oven or in a toaster. At this point, you can either set 1-2 sliders on the pita bread or open the pita and stuff them inside (I prefer the latter). 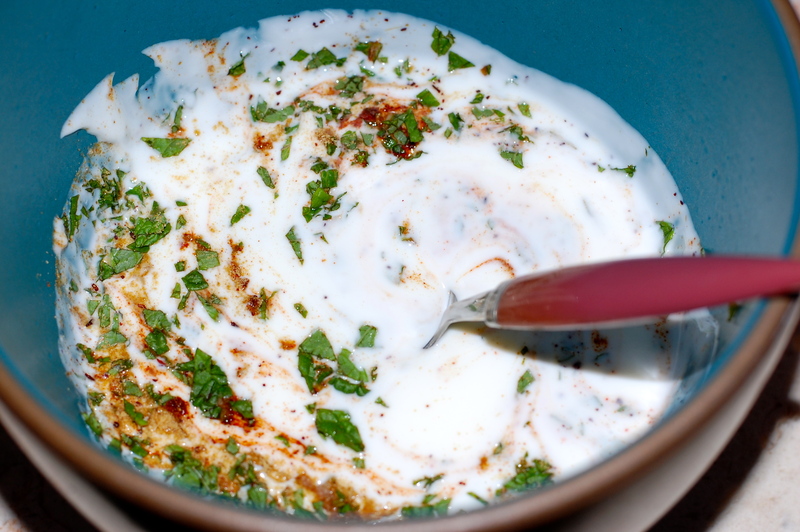 Drizzle with lots of yogurt sauce and serve. If your family is anything like mine, you will need LOTS of extra yogurt sauce. I couldn’t help but also add padron peppers as a side dish to this dinner.If you haven’t already tried these, you should. They take about 5 minutes to prepare, no work other than washing is involved, and they are addictively delicious. And generally not spicy. 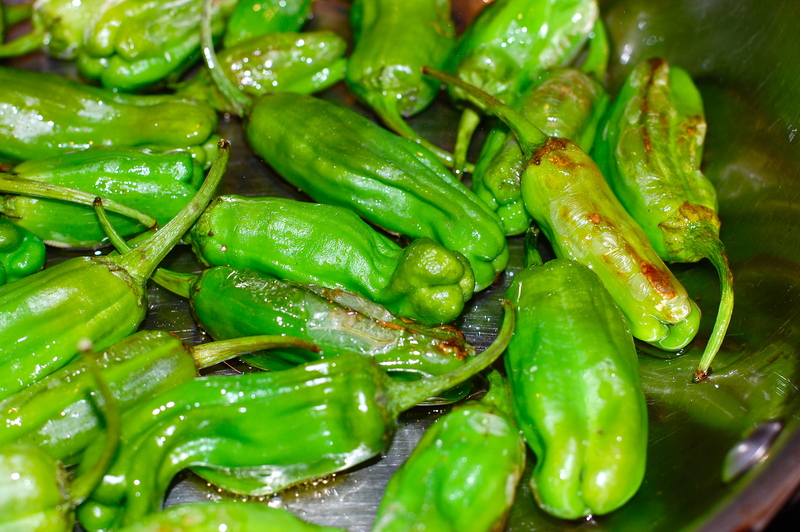 Quick sautéed padron peppers with olive oil, sea salt and pepper. Yum! 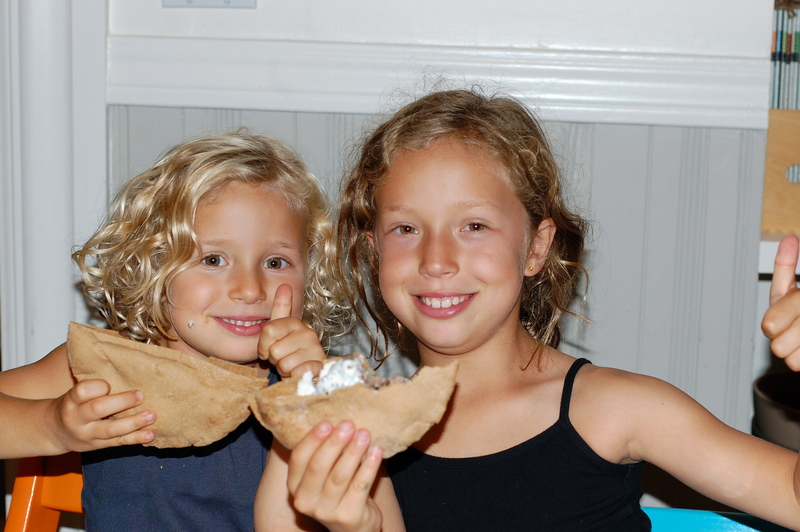 « Older Post Join the Hunger Challenge, September 11-17, 2011	» Newer Post Easy, Delicious From Scratch Beans (Yes). Bisphenol A (No). Thanks Lena! This meal was a huge hit with the whole family — 3 year old on up! The sliders had such a nice zippy flavor and the yogurt sauce was great on top of brown rice and a cucumber salad.